Thank you Stephen for your kind testimonial, and we wish you all the best in your trading! With our unique 7 Step Formula and 4 Proprietary Trading Strategies, 15 minutes a day is all we need to start making consistent profits, and create a 2nd source of passive income. We take special pride in our post-course support and training, with our ongoing monthly LIVE! market workshops, and daily discussions in our private forum and live chat groups, which is why most of our new students come from referrals from past graduates, and we have a long waiting list of people eager to join our exclusive network. To date, we have had 100% positive reviews and a strong YES! when asked if they would recommend their friends and family to our training program. https://i1.wp.com/synapsetrading.com/wp-content/uploads/2012/11/Stephen.jpg?fit=2448%2C3264 3264 2448 Spencer Li http://synapsetrading.com/wp-content/uploads/2014/03/logo-header1.png Spencer Li2015-07-08 08:30:552016-02-07 18:41:07Testimonial: "Systematic and Effective Trading for a Passive Income"
Testimonials: "Very Detailed and Good Explanation of Concepts"
"Trading Foundation Workshop" Raving Reviews + Weekly Trading Results! 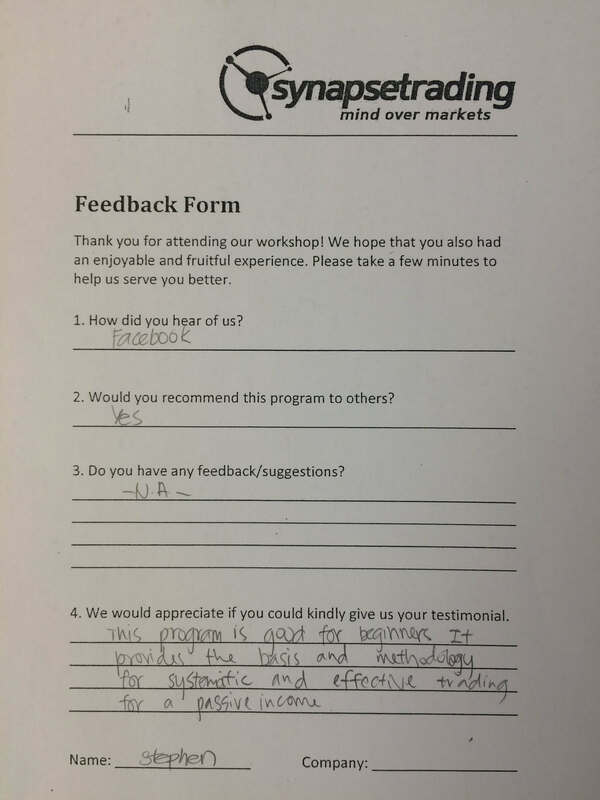 Testimonial: "Great Thing to have Followups such as Trading Workshops, Refreshers, LIVE Chats"
Testimonial: "Not Found in Traditional Textbook Knowledge"
Testimonial: "Very Clear Methods & Strategies to Use for Trading"
Thank You for the Invitation to Speak at "Financial Outlook 2016"!